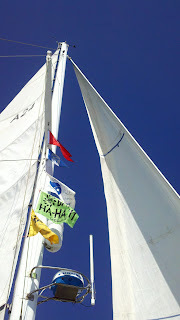 Sailing Adventures of David & Kathy: Fwd: LightSpeed Sailing into Marina del Rey. Subject: LightSpeed Sailing into Marina del Rey. Seven Seas, Sloop Tavern Yacht Club, Pacific Puddle Jump, Baja Ha Ha 2011, Baja Ha Ha 2005 flags flying.